Eating habits, as well as food technologies, have changed much over the past 75 years. While our grandparents grew up eating fresh, perhaps even home-grown, foods, today’s generation is more likely to live off staples such as Kraft Dinner or the ever-popular McDonald’s. My mum has told me how, as a child, she and her five family members would share a tin of kippers as a snack. Nowadays, the snack of choice would perhaps be a bag of potato chips or a bowl of sugary cereal. Even those who strive to make healthier choices do not, in many instances, eat locally-produced, unfrozen food. Food manufacturing and preservation have become increasingly ingenious over the past few decades, so that most foods in the grocery store have been tampered with in some way. 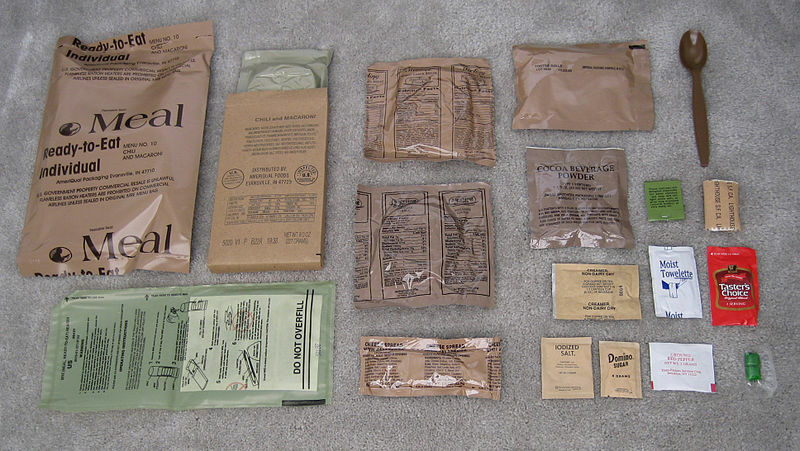 Likewise, these societal changes have extended to military rations as well. 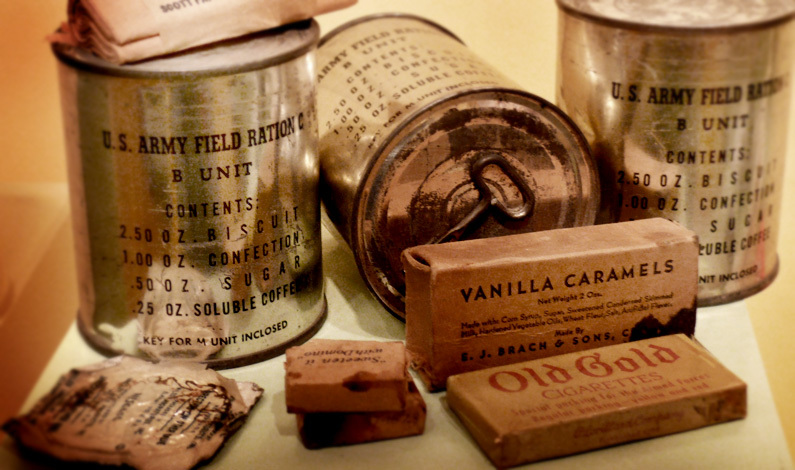 Soldiers in World War II ate things such as tinned meat, local fruit and vegetables, and bread- modern armies are supplied with a huge array of prepackaged and freeze-dried fare for consumption in the field. My point is that, spoiled as we are in the 21st century developed world, it is hard to imagine the hardship of being hungry. Challenging though it is, imagine the state of true hunger coupled with the stresses of combat. This was the sober reality for soldiers of the Red Army in WWII. The numerous pincer movements made by the Germans early in the war cut off Red Army supply routes, which often starved the encircled troops at the front. Many of these soldiers were from peasant backgrounds and were not unaccustomed to hunger, but to endure such hardship in combat is quite unimaginable. The Red Army generally fed its troops with portable field kitchens- but these kitchens were almost always located several miles from the front, so a soldier from each unit would be tasked with walking to the field kitchen and bringing food back for his comrades. This must have been more than a little inconvenient, and I imagine that there must have been several instances where the lone soldier was killed on his journey, leaving his unit hungry. 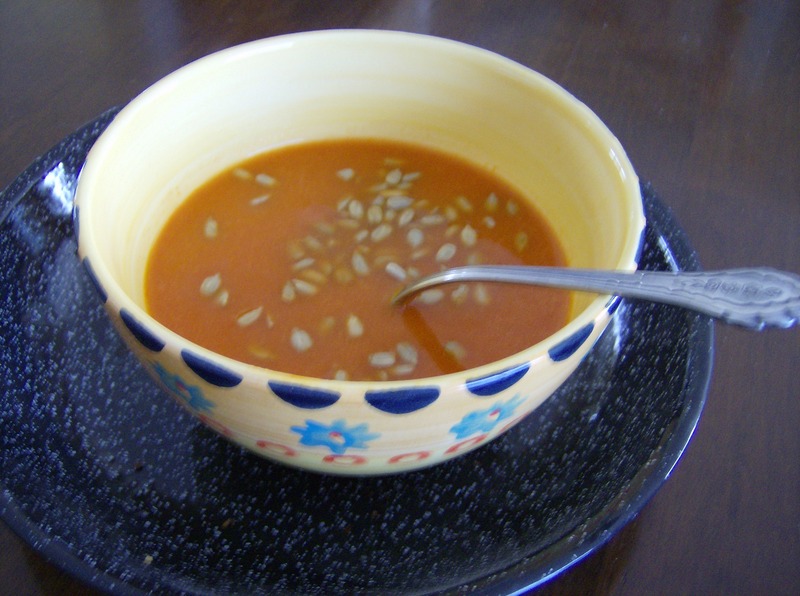 Kasha: a buckwheat porridge that was boiled and could be flavoured with meat. Okroshka: a cold soup of raw vegetables, boiled potatoes, meat, and kvas- which is a fermented beverage made from black bread, immensely popular in Russia. Tyurya: similar to okroshka, but with bread soaked in kvas instead of vegetables. 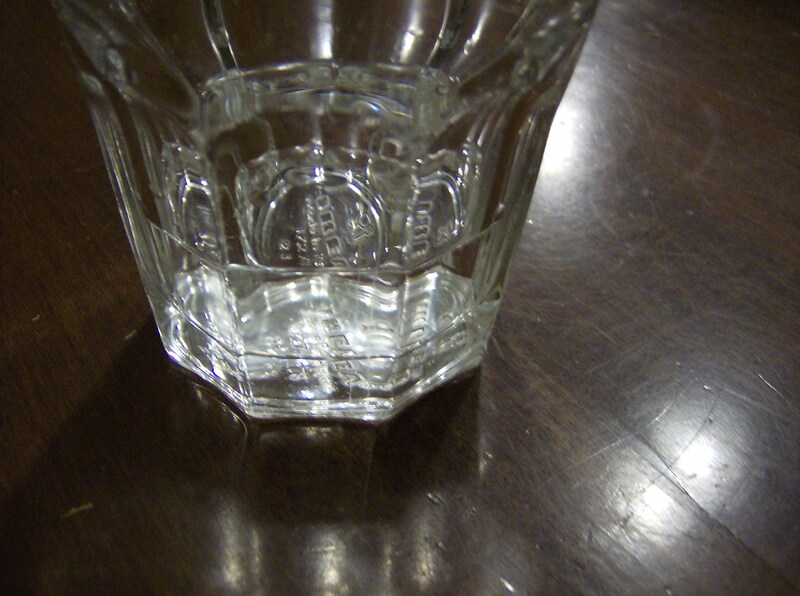 Vodka: the Red Army soldier received a daily ration of vodka; at 100 grams, it wasn’t much, but it was greatly enjoyed. Later in the war, the vodka ration was increased because of its positive effect on morale. Dishes like kasha were only easily available when a field kitchen was nearby, and food in combat could be very different. In advance of an operation, however, Red Army soldiers would be issued some sort of sustenance that wouldn’t immediately spoil. This was often black bread and sausages, or perhaps a tin of SPAM; America sent huge amounts of SPAM to the USSR as part of the Lend-Lease Agreement, and the food was a welcome help. In particularly tough times, however, soldiers were left to find their own food. They learned to forage and to rely on the generosity of civilians; female soldiers were usually sent on the latter errand, since they would seem less intimidating to frightened civilians! On Tuesday this week, I decided to eat nothing but Red Army-style field rations. This was quite an experience, and although I was hungry, I enjoyed it and gained a new appreciation for the life of the Red Army soldier. 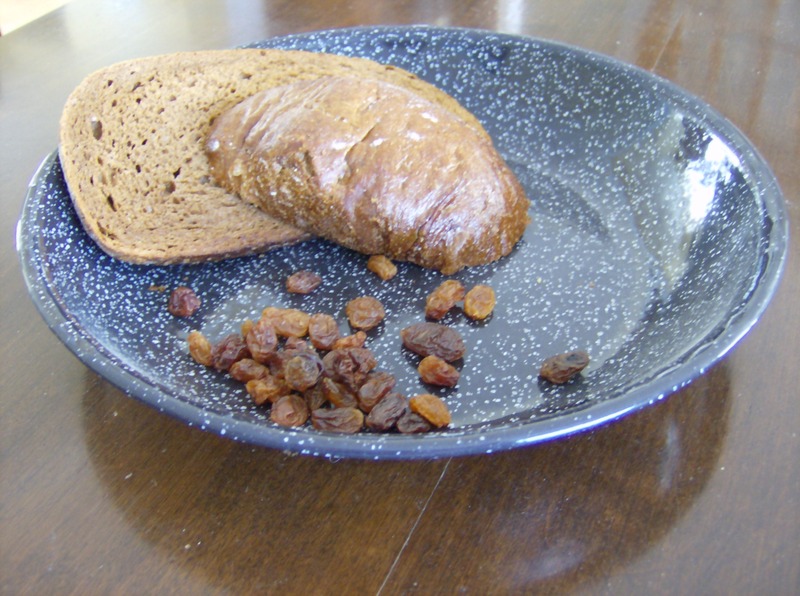 I began my day with some stale pumpernickel bread and dried raisins; neither of which were particularly appetizing. However, I’d just done a half-hour workout on the treadmill, so I was starving and eager to eat! I really can’t imagine how difficult it would be to walk cross-country carrying a rifle all day on an empty stomach, when I was even unhappy during my short workout. It wasn’t 3 in the afternoon before I was feeling so hungry and cranky that I decided to have a nap, in an attempt to distract myself. This method did work, however an afternoon nap would hardly have been an option for Red Army soldiers in the midst of combat. 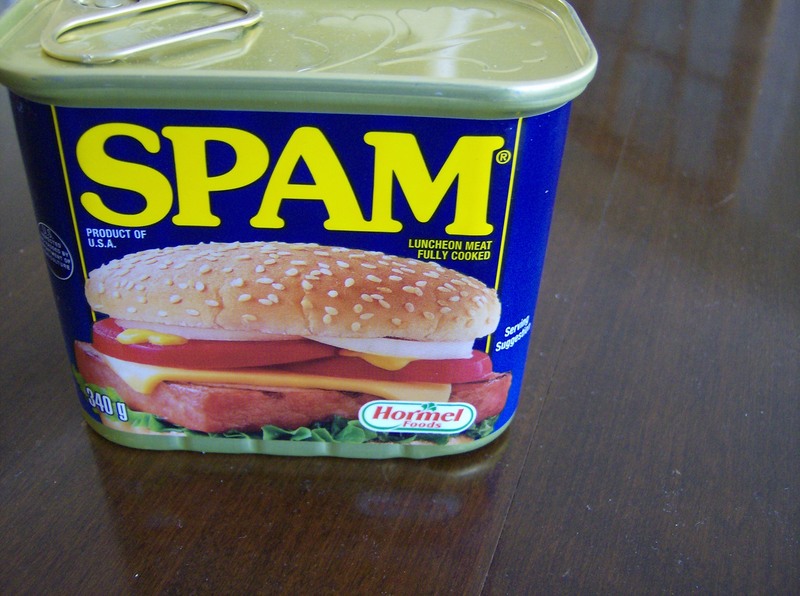 Finally, it was suppertime- time to open a tin of SPAM! My parents gave me a tin of the stuff for Christmas, but I don’t think they expected me to eat it as part of a Red Army meal! SPAM helped to save the starving Red Army during World War II- although I wonder what the Russians really thought of it! 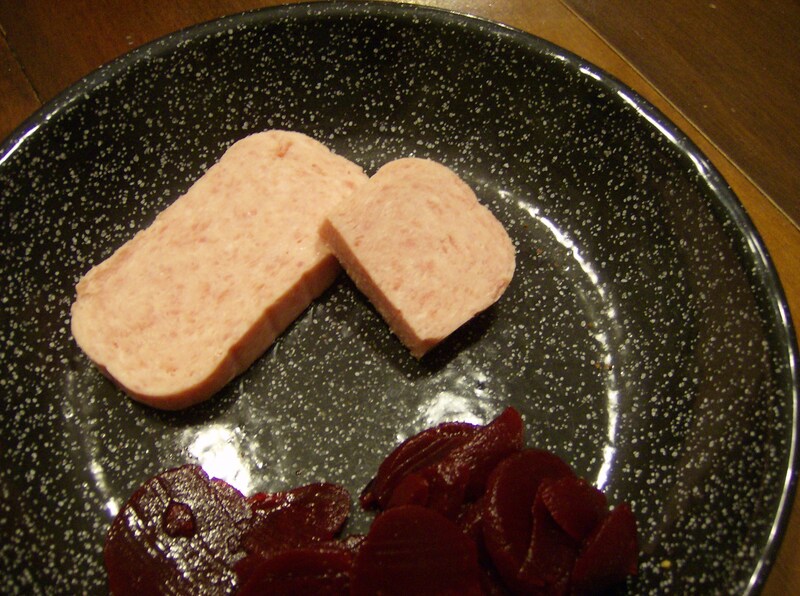 I had SPAM with some pickled beets and a ration of vodka, and I sincerely enjoyed my supper! Still, it was all very salty, and living for more than a few days on fare like this would be unpleasant if not vile. It’s a wonder that soldiers of the Red Army managed during WWII, and I have great respect for them for doing so. Like surely many Red Army soldiers, I was really looking forward to my ration of vodka. Sadly, it didn’t last long! Conditions were never easy for soldiers of the Red Army during World War II, and I hope that this post has helped to illustrate just how all-encompassing these trials were! Soldiers from any country weren’t spoiled at mealtimes, but due to the vastness of the Eastern Front and the early defensive failures of the Red Army, Soviet soldiers suffered perhaps most acutely overall. The unfortunate food situation, coupled with the ferocity and fruitlessness of much of their combat, made for a truly trying experience on the Eastern Front. Sometimes, when entertaining, one just has to be really ambitious. Simple, easy-to-prepare parties and dinners are lovely, but the guaranteed way to be remembered is to put on a really impressive and extensive feast. Of course, this does carry an inherent risk. For example, once they’ve been broken, heirloom dishes can’t be replaced; posh wine is quite expensive; and if crème brulée goes wrong, it tends to go very wrong indeed! But if one’s ambition goes well, a wonderful and momentous event results; sure to be remembered and spoken of by all involved for years to come. Such was the case for me a few weekends ago, when I put on a Georgian-style dinner for my family. Thankfully, I had my mother’s help in preparing it- otherwise it could have been a disaster, or would have at least been very, very late! My wish was to create a luxurious, elegant, and reasonably authentic Georgian meal. Thus, I spent the entire day carefully setting the table and searching for such special things as my grandmother’s family’s silver cutlery and our seldom-used white cloth napkins. When entertaining, I always enjoy planning and setting the table more than the actual cooking- I find it much less tedious and daunting! But this dinner was one of the most enjoyable I have ever organized, and both food and tablescape turned out beautifully. 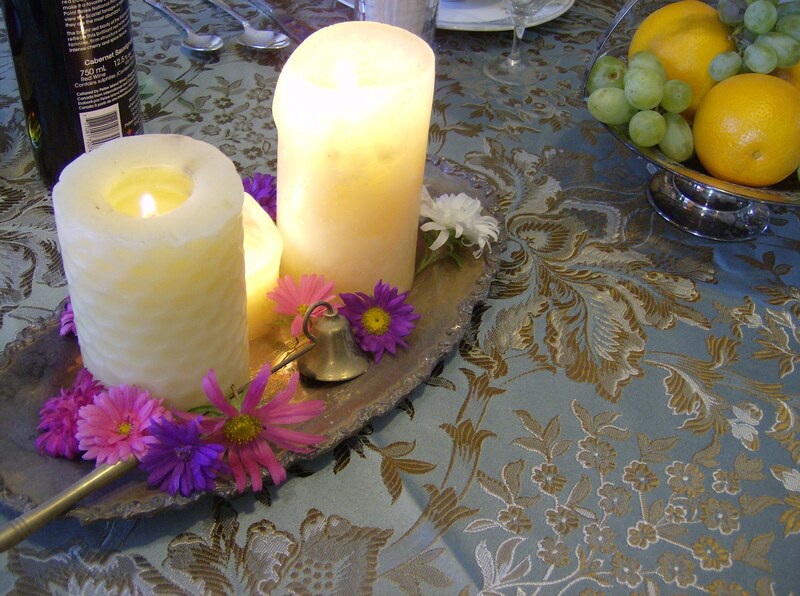 To create a suitably grand appearance, I used a fantastic blue and gold damask tablecloth and heirloom plates from the 19th century- how appropriate! 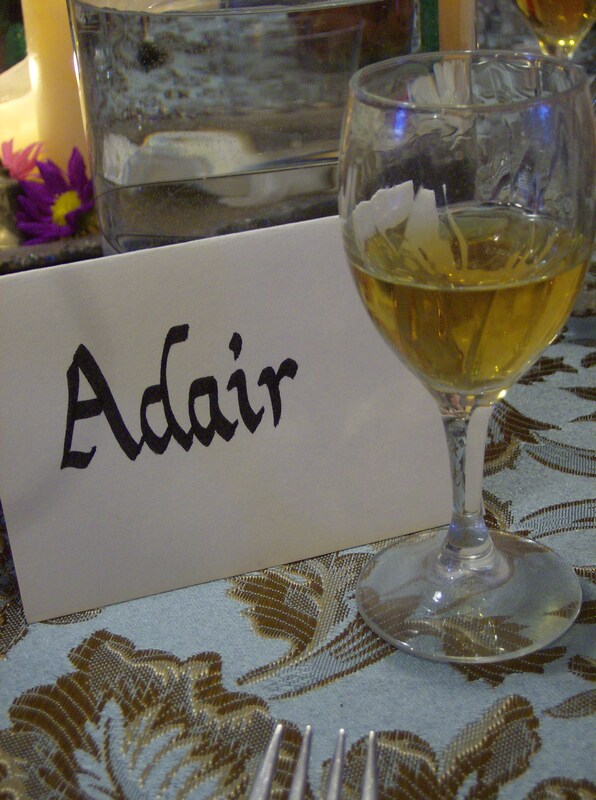 Each place setting had two glasses, one for water and one for alcohol, and the napkins were folded into the water-glasses with a flourish. It took me quite some time to gather together everything seen on this table, but the result was worth it! 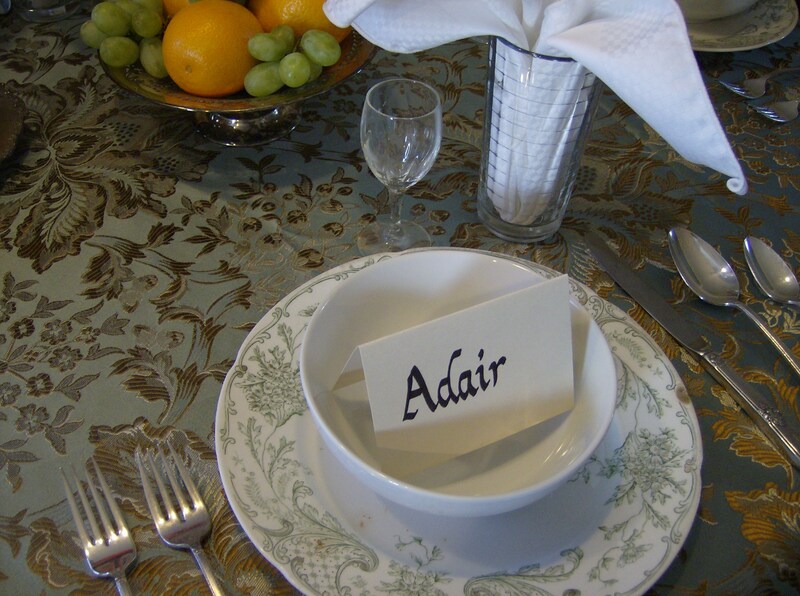 I also added some hand-made place cards which gave a perfect, old-fashioned touch. Thank goodness for my knowledge of calligraphy! The table was further adorned with a candle-lit centrepiece complete with flowers from the garden, and fresh fruit piled high on silver dishes. Now we come to the true climax of any meal: the food. 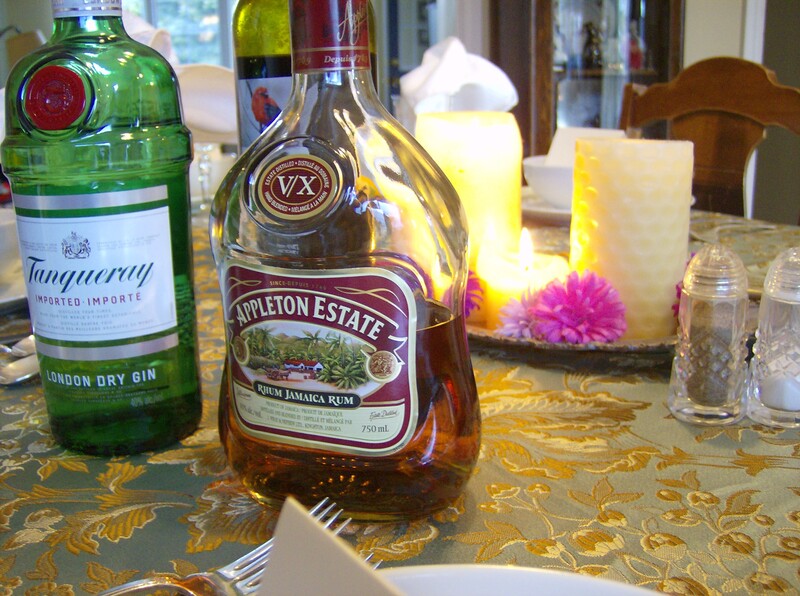 To drink, I offered Jamaica rum, gin, and sauvignon. Of these three, I felt rum was the absolute necessity- after all, the Golden Age of Sail commenced at the end of Georgian times, and the navy’s love for rum is legendary. 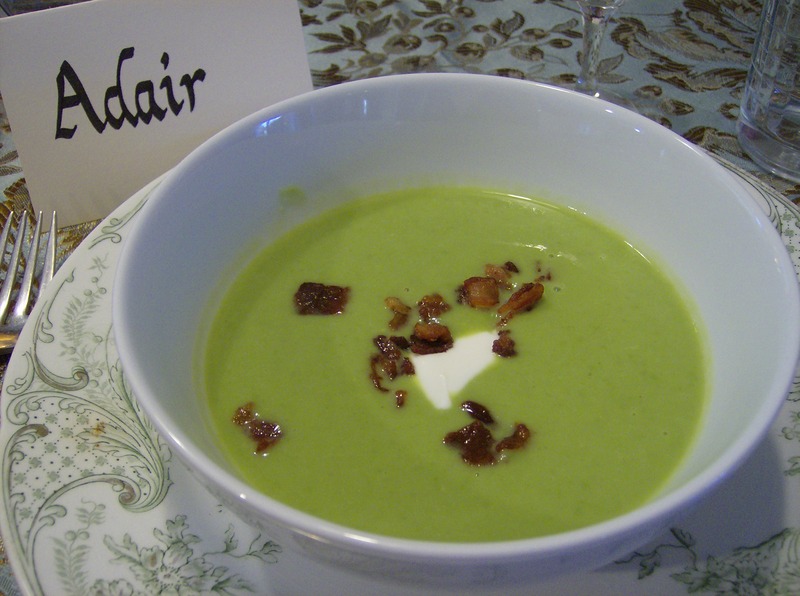 A soup course came first, in the form of a delightfully green pea soup with sour cream and crispy bacon. I don’t think I’ve ever had a better soup- this was incredible. It was creamy and delicate in flavour, and was the perfect appetizer for such a refined feast! 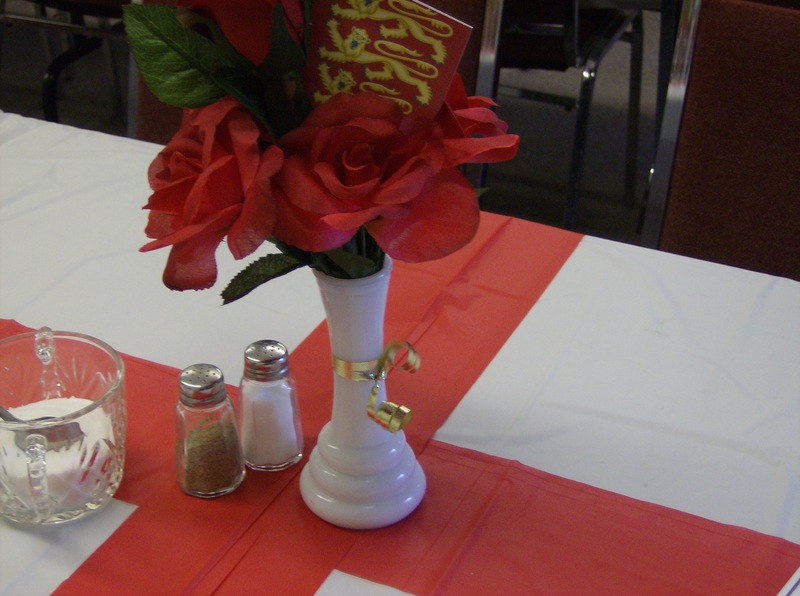 The exquisite colour of the soup added to the table decor! The main course included a wonderful Welsh onion cake, which is one of my all-time favourite recipes, and a true culinary masterpiece: beef Wellington. There was no way I could choose anything but beef Wellington- since it’s a real treat and its namesake is one of the Georgian era’s greatest heroes! 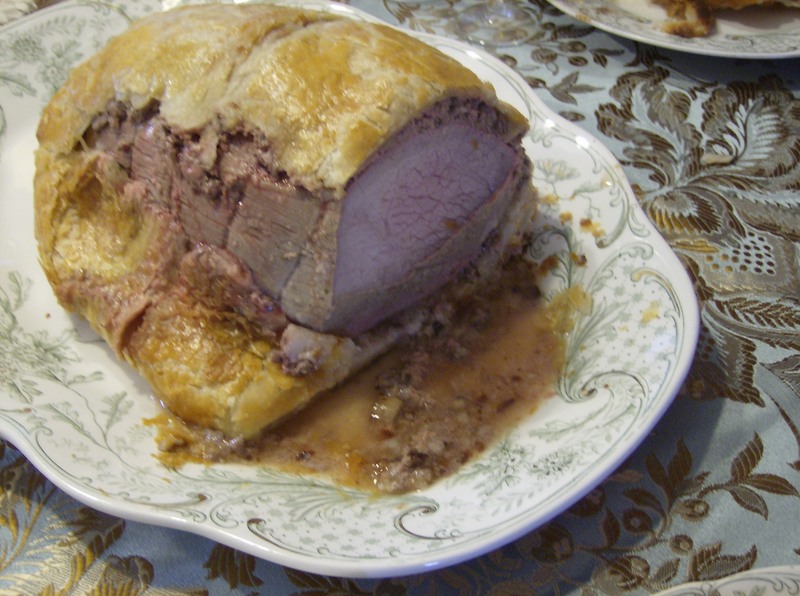 Contrary to what the TV series Hell’s Kitchen might suggest, beef Wellington wasn’t terribly hard to execute. I did have some trouble finding a cut of beef suitable to be used for the Wellington, and even after a troublesome search I don’t think I bought quite the right thing, but the dish was delicious anyway. The pastry was crispy, the beef juicy, and the mushroom-and-liver paté one of the tastiest things imaginable- and I don’t even actually like mushrooms! It just wasn’t perhaps as photogenic as Gordon Ramsay might want! The onion cake: just a very basic combination of onions, potatoes, and butter, but so scrumptious! A fresh and beautiful trifle was served up for dessert. 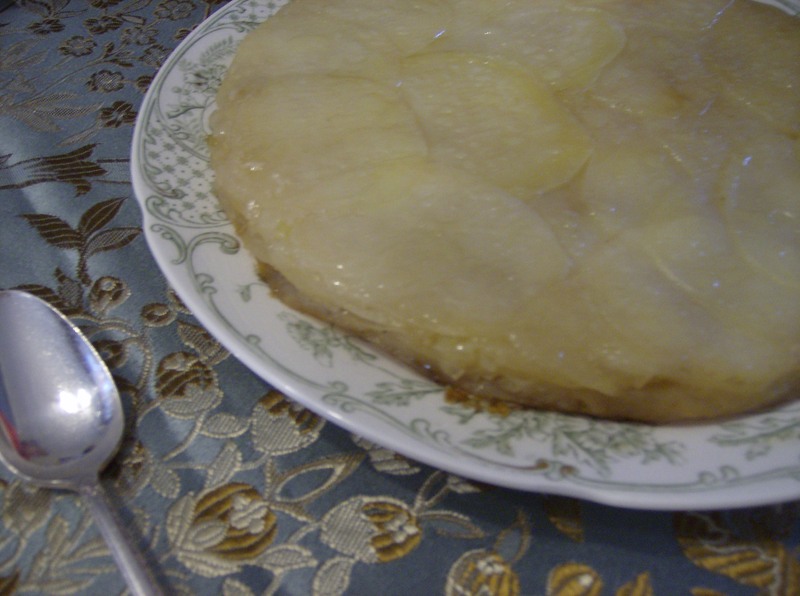 It’s such a classic English dessert, and has been loved for hundreds of years. Its inclusion of fruit also made me and my dinner-guests feel a little less guilty about having had so much of the previous courses! I was so pleased with the success of my Georgian feast! 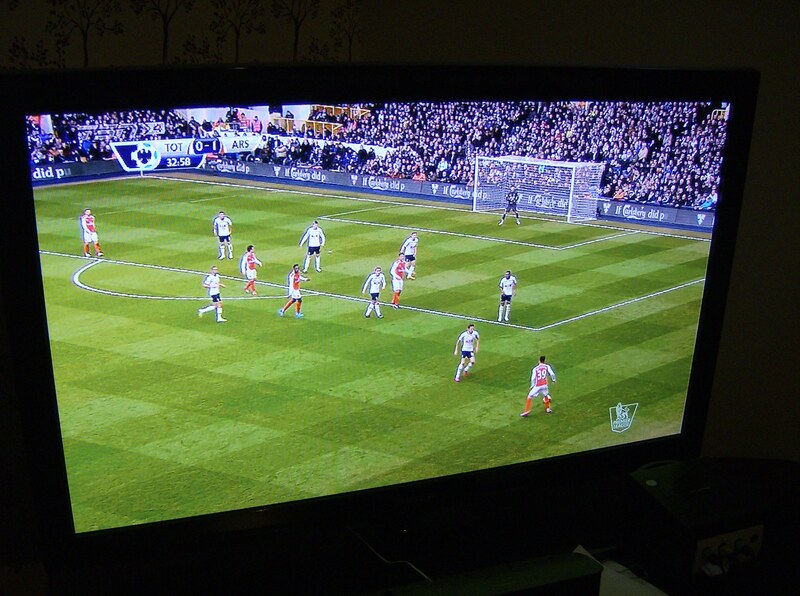 It was ambitious, and there were a few small hitches in its preparation (to be expected), but the result was brilliant. Every once in a while, it really does pay off to commit to trying something really fancy! Sadly, the summer of 2014 is almost over. Although if you live in Ontario, it hardly feels like there’s been a summer at all- since April, it’s either felt like a sodden spring or late October, with the smell of cold in the air. 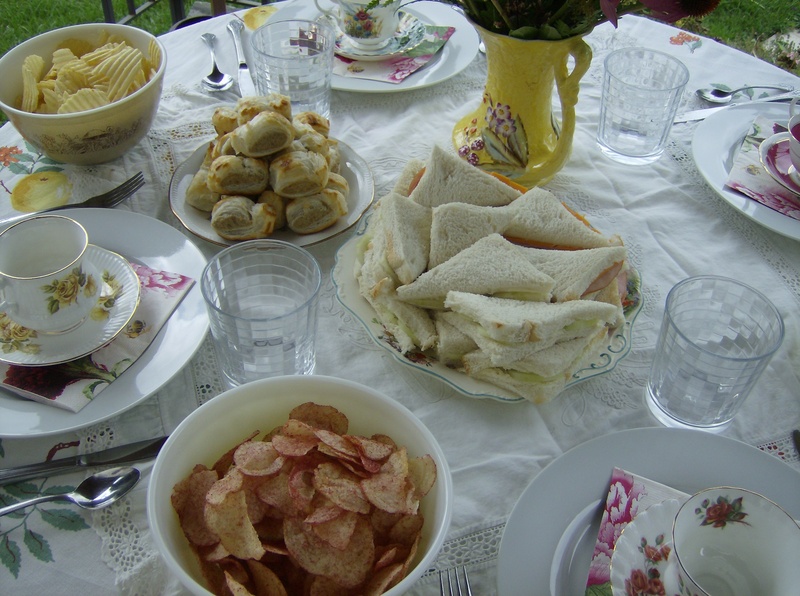 Not to complain, though; yesterday was lovely weather for a garden party, and sitting outside eating cucumber sandwiches and crisps from chintzy china immediately took me back to England. The ingredients for a good garden party are simple, although not all controllable. First, one needs a pleasant day without rain- nobody wants to be sinking their heels into muddy ground, or sipping Earl Grey mixed with rainwater! 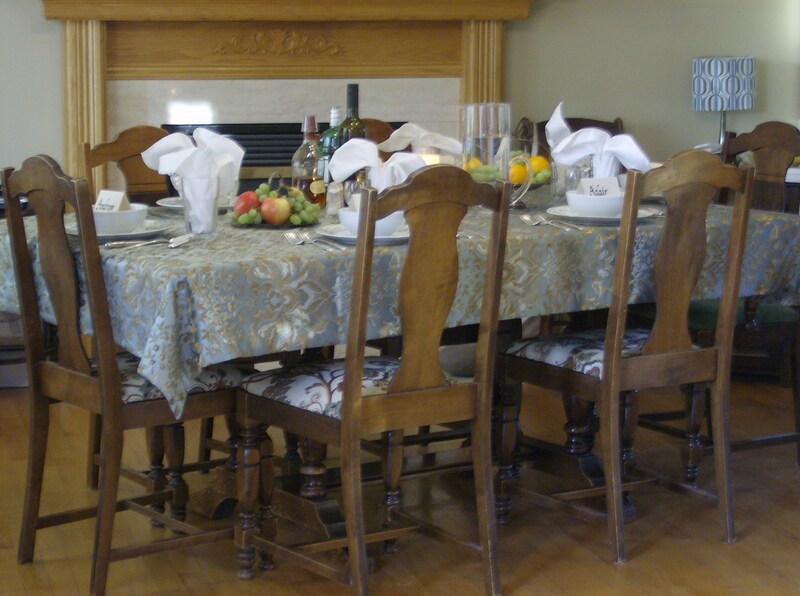 Activities are also necessary; as they put the guests at ease and give them something to do while the food is prepared or while everyone is feeling lazy and full after the meal. Croquet is a quintessential garden game, but I also like games such as Trivial Pursuit or Chinese Checkers. 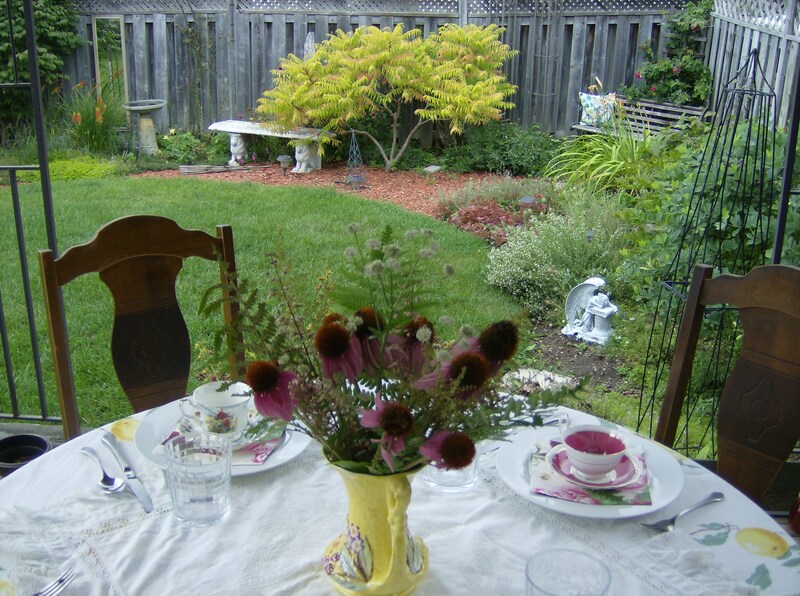 The atmosphere of a garden party should be green and relaxed- my mother keeps a beautiful garden, so I have the ideal setting for garden parties at home. 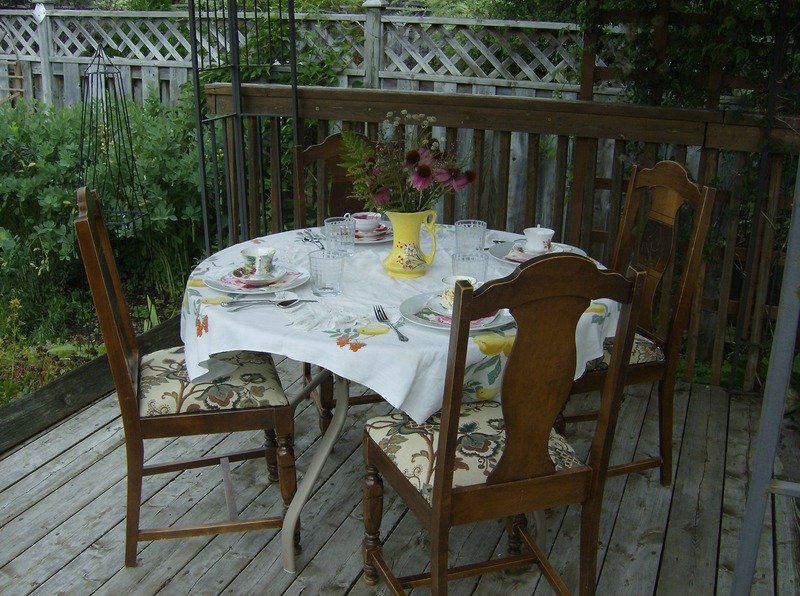 I set up our table beneath a sort of gazebo on our deck, and planned to put up some bunting for extra charm, but the bunting went missing so the nearby flowers had to suffice for decoration! 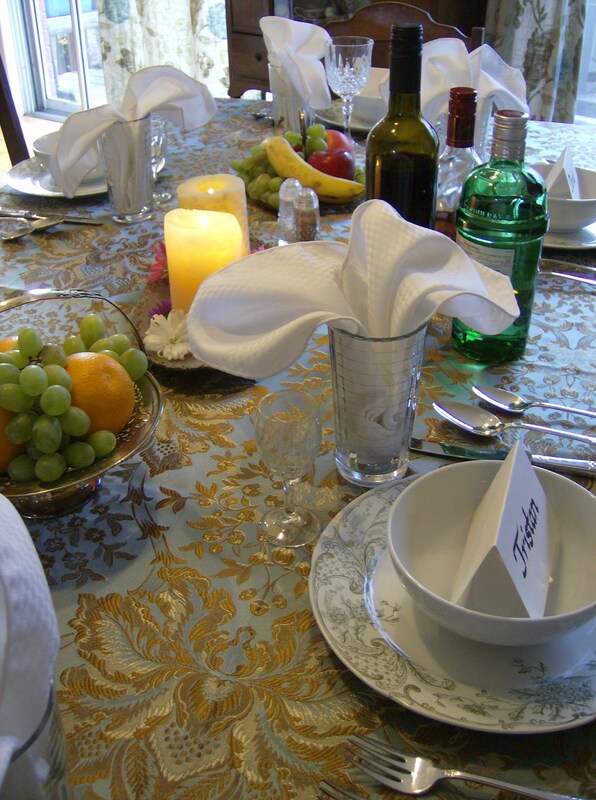 I love both interior design and entertaining, so setting tables is one of my favourite things to do. 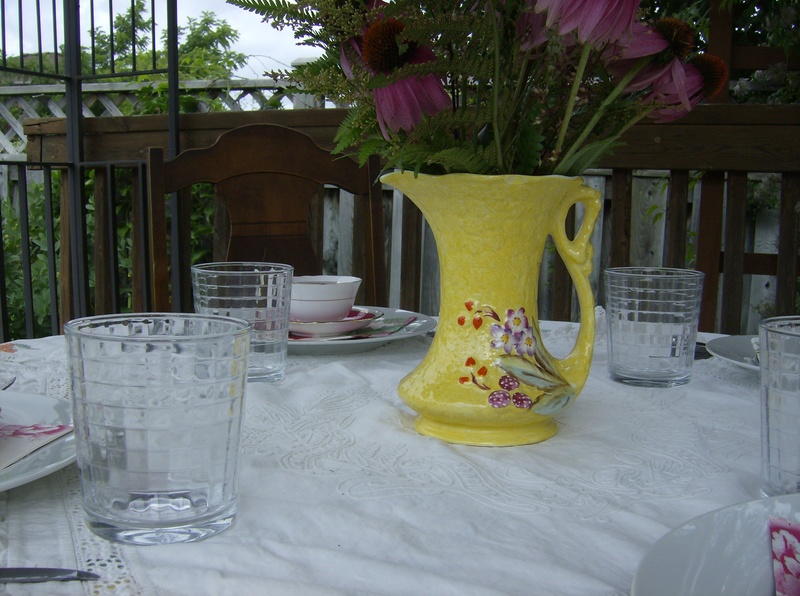 And garden parties offer a fabulous opportunity to use vintage dishes, which appeals greatly to my traditionalism and nostalgia! 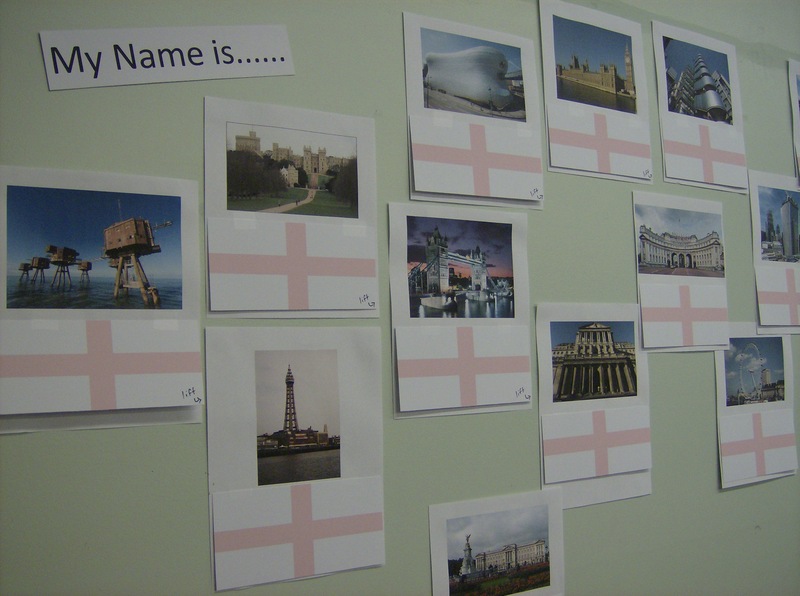 I don’t think one can hold an English-themed party and not serve tea- it simply isn’t done! But in addition to tea, I had the English drink of summer: Pimm’s English-style. 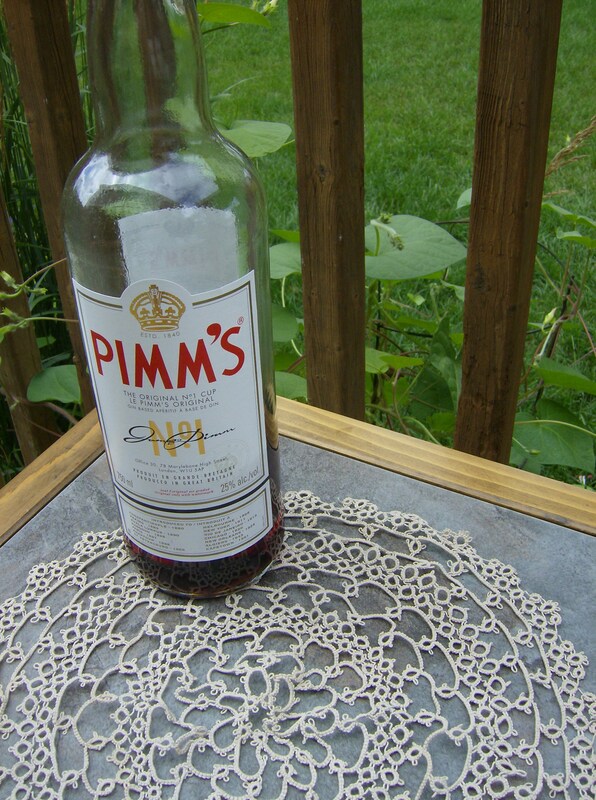 This classic is just Pimm’s No. 1 Cup mixed with lemonade; simple and delicious. Despite the pleasant weather, charming table settings, and nostalgic drinks, the highlight of this garden party was the food. My dad helped me make sandwiches (we had cucumber, ham & mustard, and ham & cheddar), and we also had sausage rolls and assorted crisps. Everyone was well-fed and happy! I didn’t neglect dessert, however- we had trifle, which my mum has made for many a birthday over the past twenty years. It is absolutely stunning in taste and appearance, and was the perfect ending to the party. 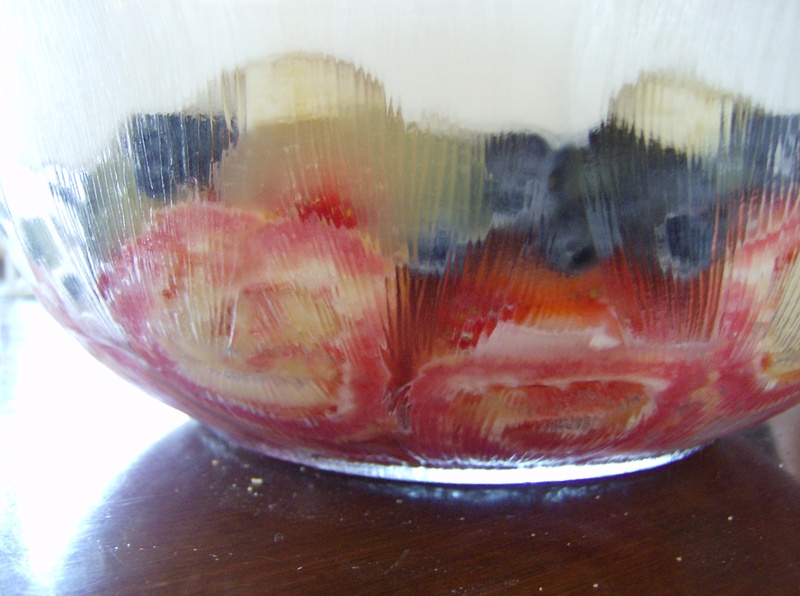 Jelly rolls, cream, and berries make such a delectable dessert! A garden party need not take hours of planning, and it doesn’t need a complex three-course menu or loads of supervision. The charm of this little event is its simplicity, and it’s best when it celebrates the joys of summer without too much of a fuss. British cuisine is exactly my type of fare- tasty, hearty, historically interesting, and best served with a pint of ale. Most of my favourite foods are of British origin, and I am delighted that there has been a recent resurgence of interest in traditional British food. 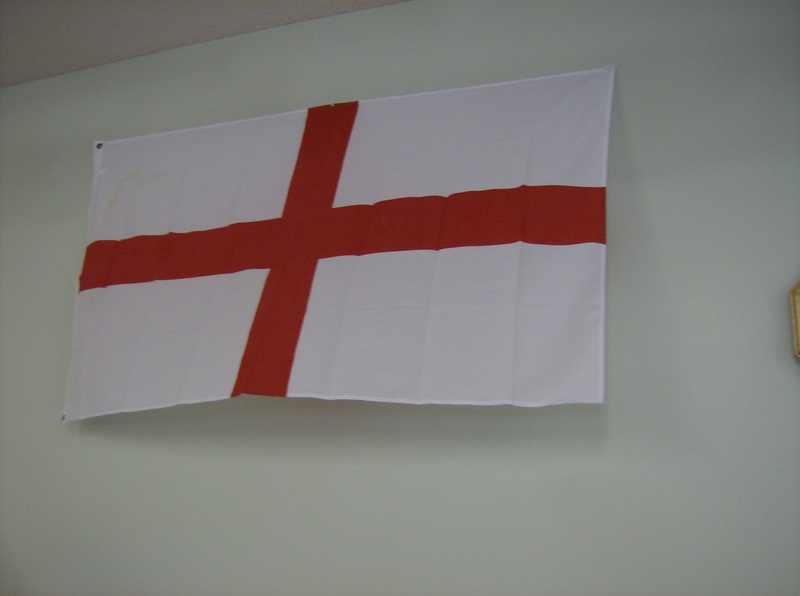 I enjoy most British dishes, although a few (like jellied eels or haggis) I am in no rush to try. Here is a compilation of my favourite British foods, because British cuisine really is the best! Fried bread makes me actually want to get up early on Sunday mornings. That alone should be ample evidence of its brilliance, since sleep is one of my favourite things, particularly after playing hockey as I do until 11 pm on Saturday night! Fried bread really is one of my joys in life- greasy and crispy with a subtle taste of bacon, it starts my Sundays off right. I usually eat it plain but it is also fantastic with bacon and ketchup. 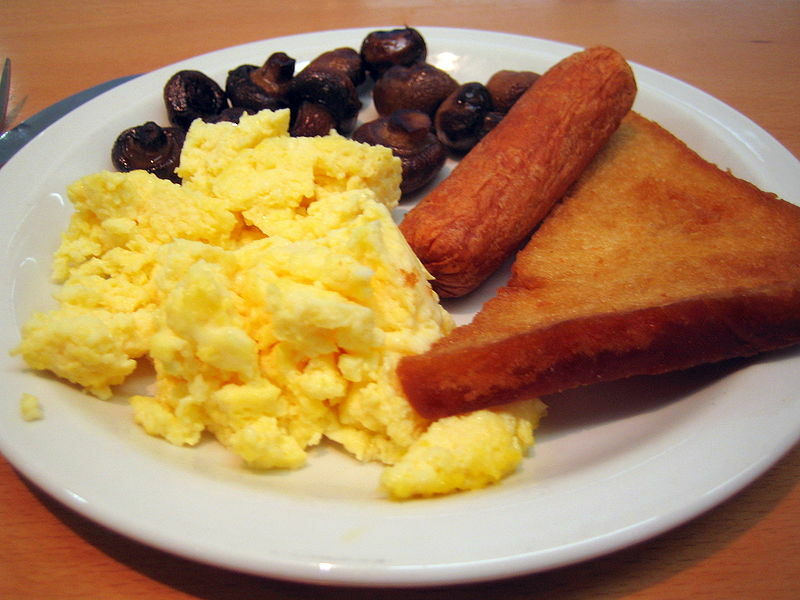 Although it is often part of a Full English breakfast, I’m afraid that I find it too filling to eat in combination with so much other food! 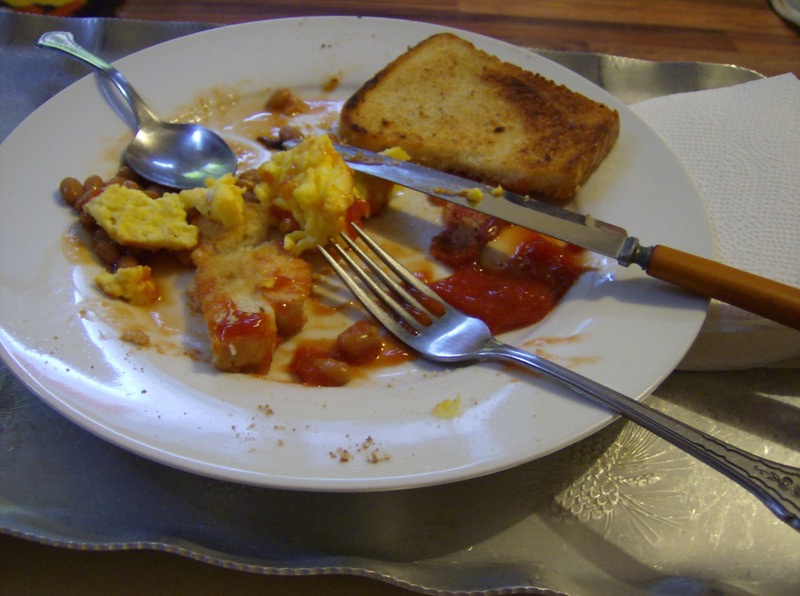 Photo of breakfast (fried bread on right): from http://www.flickr.com/photos/loopzilla/97111082. Attributed to LoopZilla. Simply put, a Full English is a masterpiece and eating a Full English is a superhuman accomplishment! 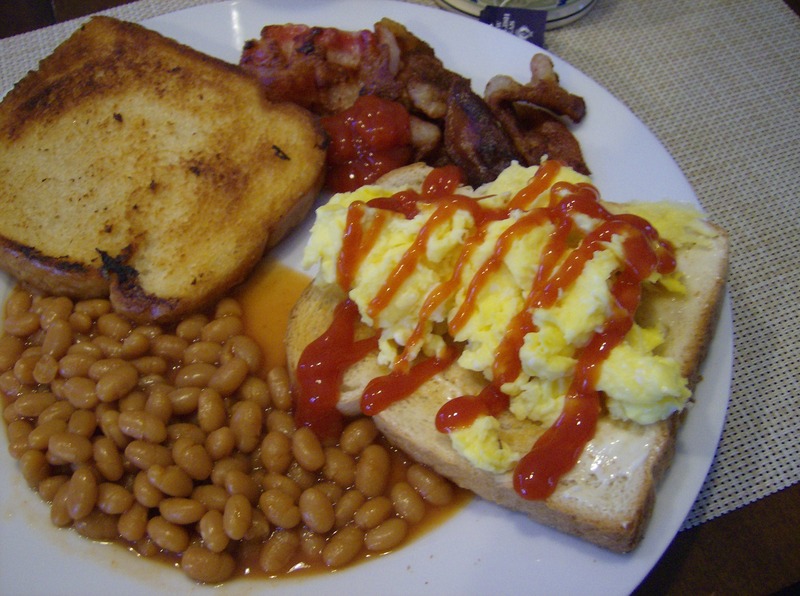 The traditional fry-up is certainly not healthy in any way, but it is absolutely delicious. Comprised of any combination of baked beans, bacon, sausages, eggs, tomatoes, mushrooms, black pudding, and fried bread or toast (perhaps with Marmite), this is a mammoth meal. Eating it will make one feel full for the rest of the day at the very least, but not too full to enjoy a pint or two later on in the pub! 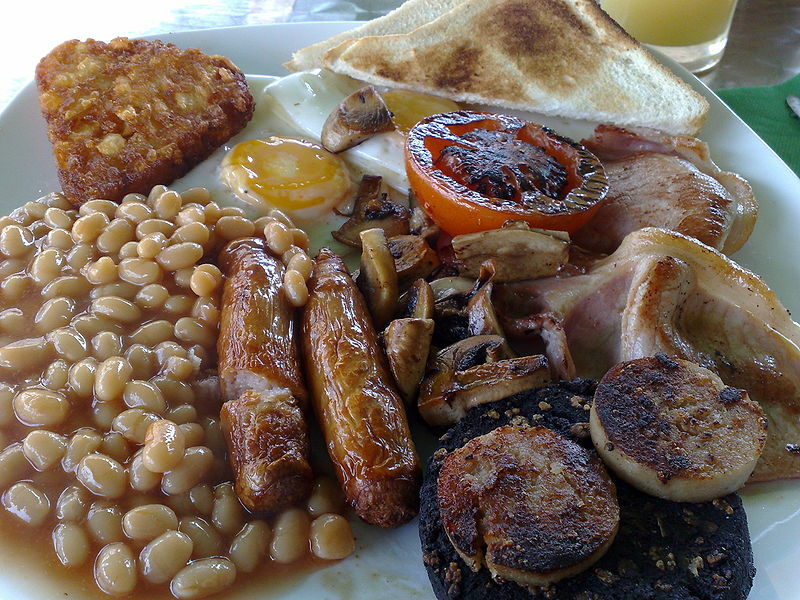 Photo of Full English breakfast: from Wikimedia Commons. Attributed to Jrv73. I understand that many people are not fans of organ meat, but I love a good steak and kidney pie! 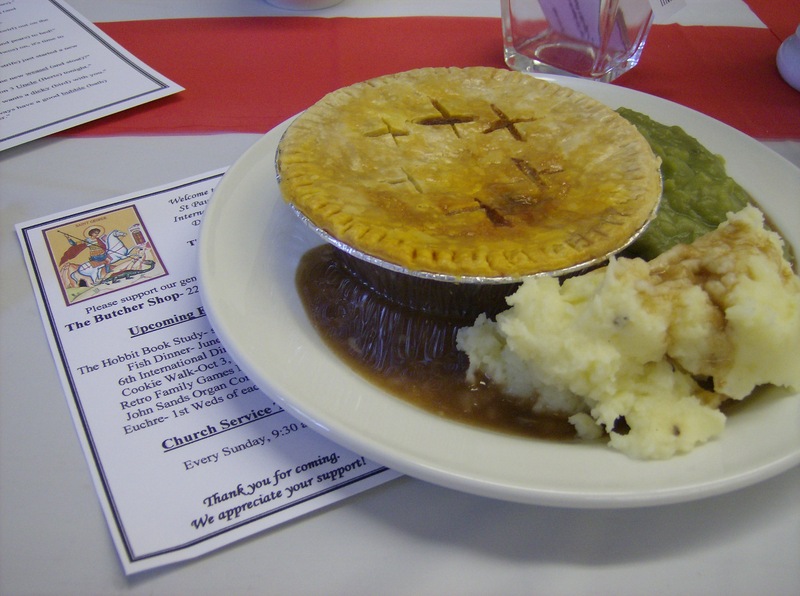 This is a very British dish, and the pie is filled with a gorgeous mixture of chopped kidney, beef, and thick gravy, perhaps with some onions or vegetables for extra flavour. My family occasionally has homemade “S & K”, as the dish is colloquially known, and its consumption takes me back to the confines of a cosy rural pub- perfect! 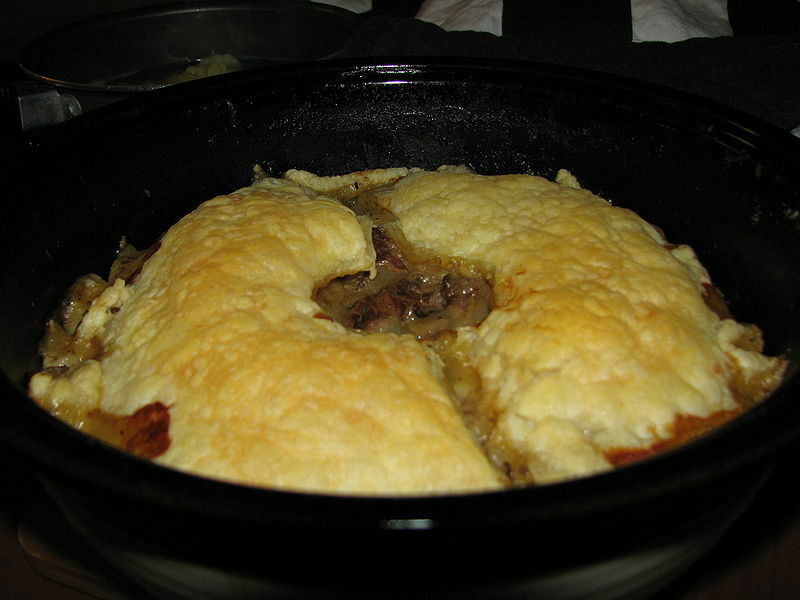 Photo of steak and kidney pie: from Wikimedia Commons. Attributed to Hellahulla. Bangers are sausages and mash is mashed potato- a simple enough premise, but when drenched in rich gravy and complemented with mushy peas, this is one of the most comforting meals imaginable. 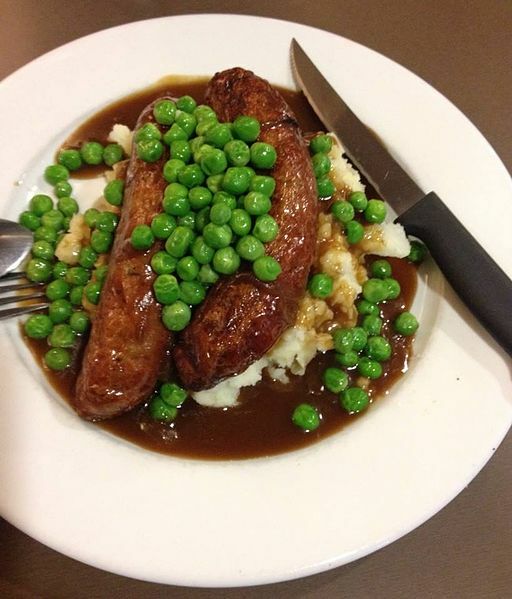 I have had many meals of bangers and mash, some of them in pubs and some at home, but this is always a sound choice and a favourite dish of mine. Photo of bangers and mash: from Wikimedia Commons. Attributed to Qwerty Binary. 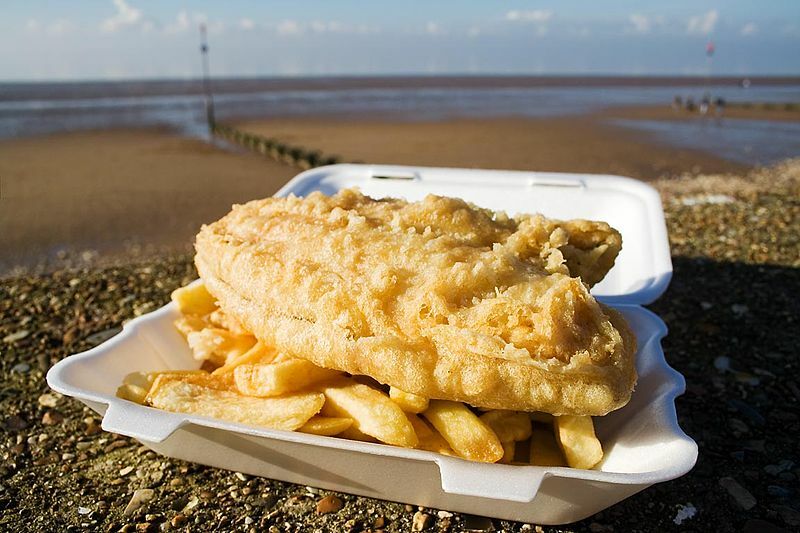 What list of British food would be complete without a mention of fish and chips? This mention is, however, greatly merited- fish and chips is a legendary national dish of the United Kingdom and is enjoyed year-round from Whitby to Cornwall to Norfolk! The Golden Hind in Marylebone is a particularly good purveyor of traditional fish and chips in London. 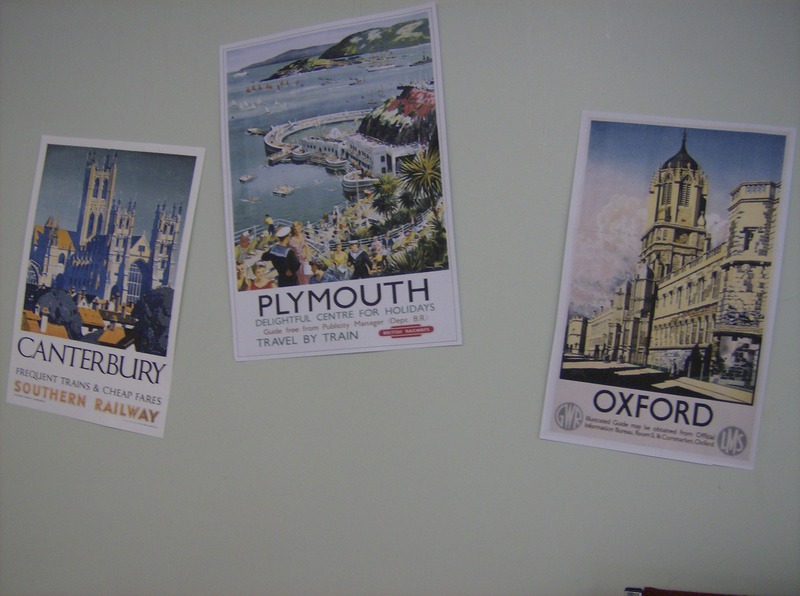 I would certainly recommend it, having dined there in May 2012. The fish was delicious, the chips thick and luscious, and the mushy peas heavenly. The Old Bell Tavern on Fleet Street is another great bet for fish and chips- in December of last year I was there enjoying a plate of fish and chips and a pint of Guinness! 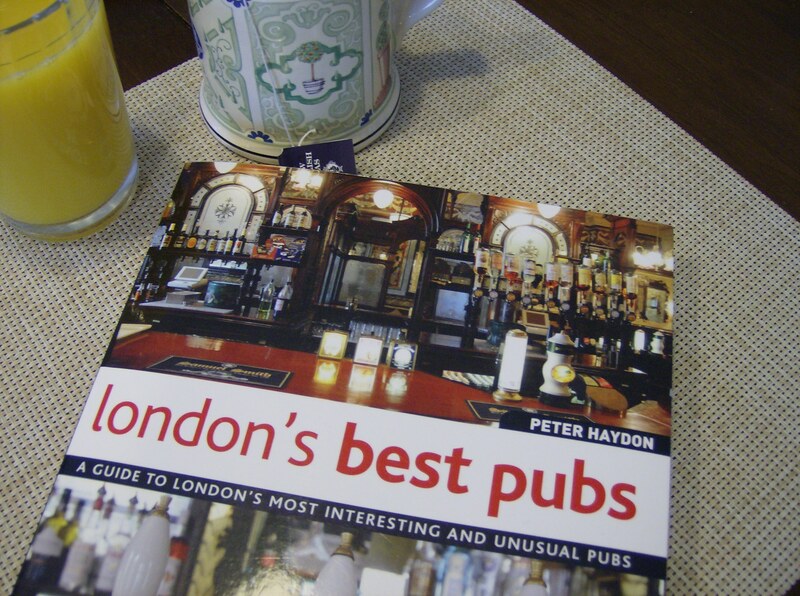 This pub has a fantastic, old-world atmosphere which adds to the experience. Unfortunately, I have not as of yet eaten fish and chips from the coast- definitely a must-do on my next trip to Britain. Photo of fish and chips: from http://www.andrewdunnphoto.com via Wikimedia Commons. Attributed to Andrew Dunn. Traditionally the accompaniment to a Sunday roast, Yorkshire pudding is a fabulously light and airy side which makes any meal feel British. My dad makes wonderful Yorkshire puddings, which are unbeatable for soaking up the thick gravy left over from a hearty meal! 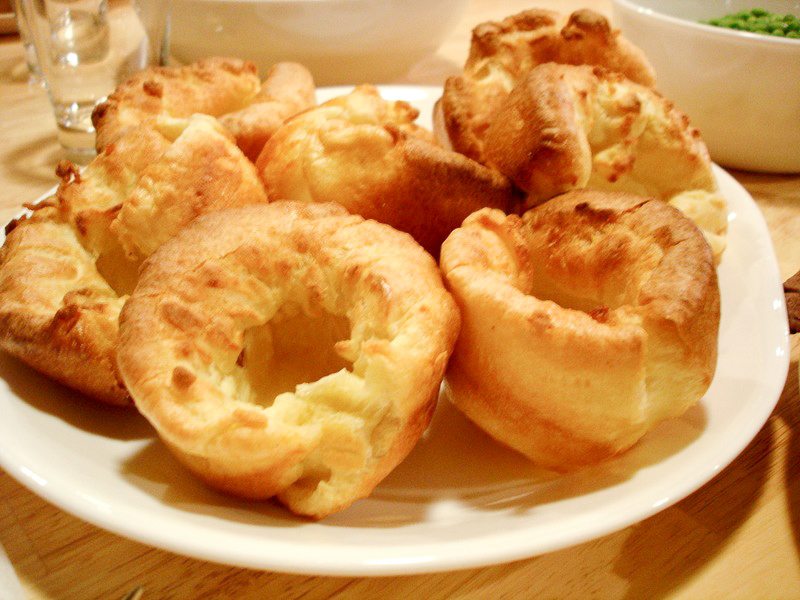 Photo of Yorkshire puddings: from http://flickr.com/photos/49502976207@N01/77683987 via Wikimedia Commons. Attributed to stef yau. Crumpets are unique and quite frankly delightful- my family has such a fondness for them that we named our dog “Crumpet”! Best eaten for breakfast or at teatime, crumpets are fascinating to look at; being porous and light but still sturdy when bitten into. I generally eat crumpets with butter and jam or honey, but they are also delicious spread with peanut butter. Peanut butter is not, of course, a British condiment- I suppose that peanut butter on crumpets is one area where my Canadian inclinations manifest themselves! 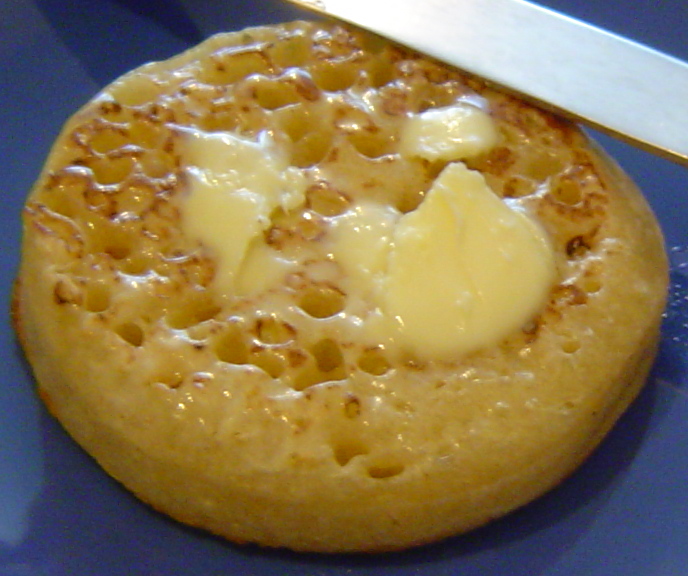 Photo of crumpet: from Wikimedia Commons. Attributed to LoopZilla. This hearty concoction is a staple of my diet in Britain! Originally made in Cornwall for tin miners, Cornish pasties are filling and wholesome and incredibly delicious. 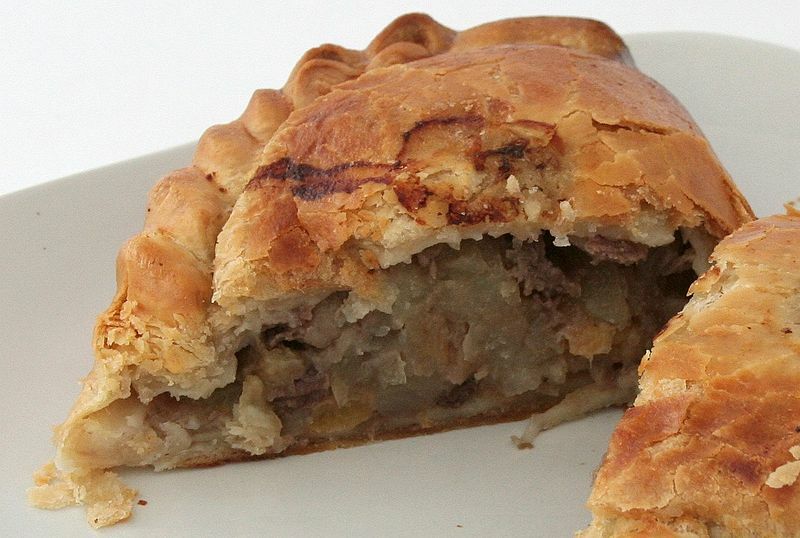 Traditional pasties are filled with beef, potato, onion, and swede, although today there are numerous variations. Cheese and onion is a favourite of mine, and pork and apple is another lovely combination. I am also told that lamb and mint pasties are beautiful- but since seeing so many adorable little lambs on a trip to England seven years ago, I refrain from eating lamb, so I wouldn’t know! London has many pasty shops, both on the high street and at convenient locations in major train or Tube stations, so a quick and tasty meal is never far away. My fondest routine in London is picking up a Starbucks coffee and a pasty for breakfast before facing the morning rush. Photo of Cornish pasty: from Wikimedia Commons. Attributed to David Johnson. In my opinion, this is the best British beer out there. I absolutely love it, and weekends when there is a can of London Pride in my refrigerator are inestimably happier than a normal weekend. 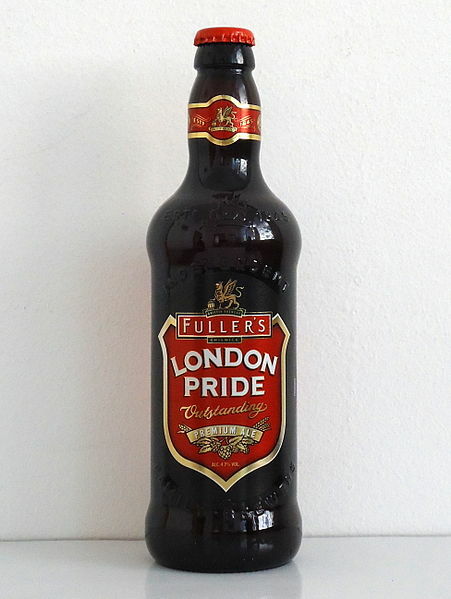 Fuller’s London Pride is a beautiful, smooth bitter with a taste that is not too sharp, but just right. Photo of Fuller’s London Pride: from Wikimedia Commons. Attributed to LeeKeoma. Although it is a lot of work, making (and subsequently eating) a traditional Christmas pud is an important Christmas ritual for me. I usually use Captain Morgan rum in my Christmas puddings, because it is a good rum and because through my granddad, I am related to the Morgan family of Wales and Captain Henry Morgan. Prior to last Christmas, I found a recipe for the famous Ritz Hotel’s Christmas pudding- but unfortunately, it called for about seven different kinds of alcohol and likely would have cost me $300 to make! 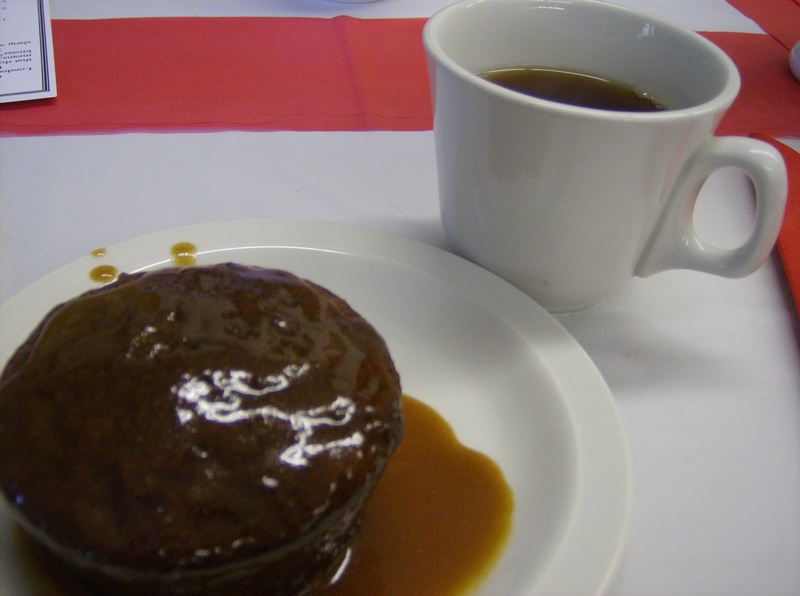 Christmas pud, with its rich and heavy texture and alcoholic taste, is not for everyone, but I enjoy it every year and it is a true mark of Christmas. 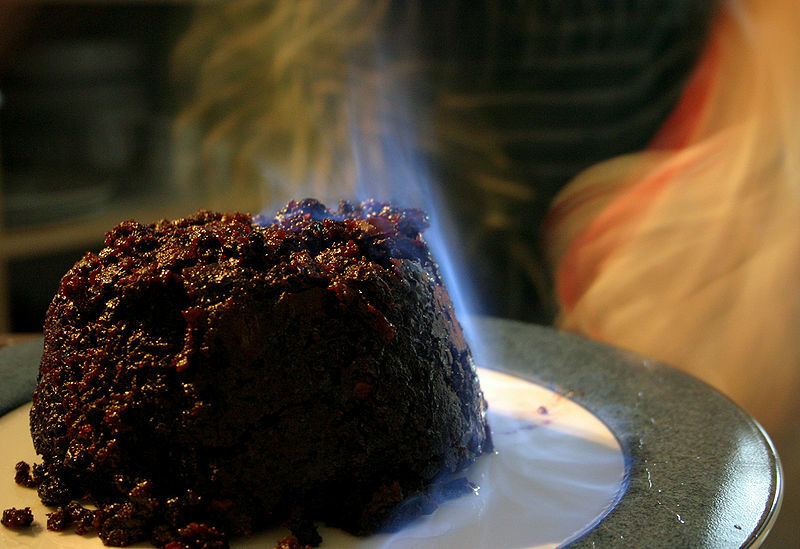 Photo of Christmas pudding: from Flickr via Wikimedia Commons. Attributed to Matt Riggott. 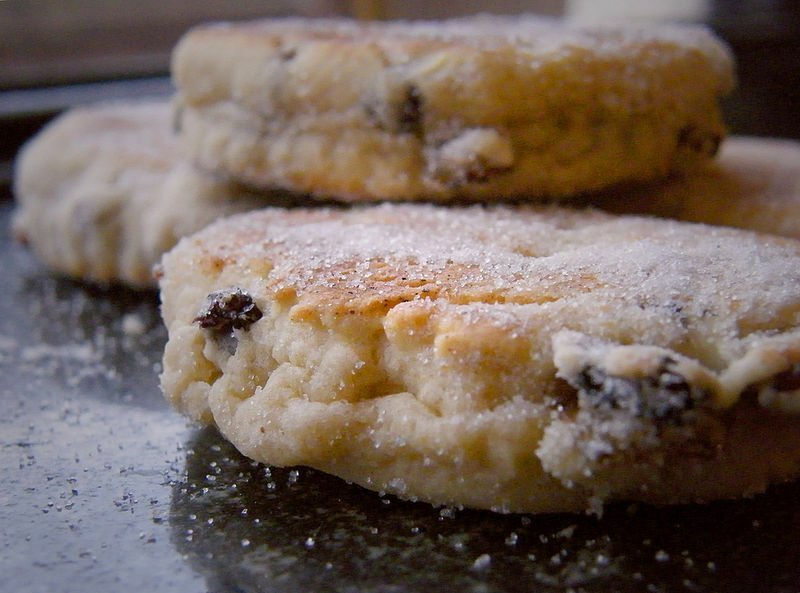 A food that my family discovered and fell in love with several years ago, Welsh cakes are a traditional Welsh snack originally cooked on a bakestone. Round and flat with currants or raisins on the inside and caster sugar on the outside, Welsh cakes are scrumptious and addictive! We always used to purchase them in packs of six from Marks and Spencer, and now I also make them at home without too much trouble. They are an ideal snack, being manageable in size and not too sweet, and they were the perfect accompaniment to my trip through Snowdonia three years ago. 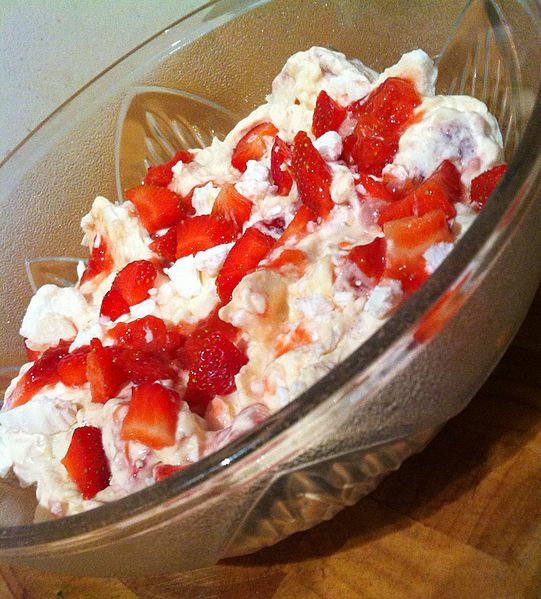 I will be a very happy girl when it is finally strawberry season again and I can eat some Eton Mess! Eton Mess is a dream dessert, evoking memories of garden parties with friends and a glass of Pimm’s English Style in the summer sunshine. 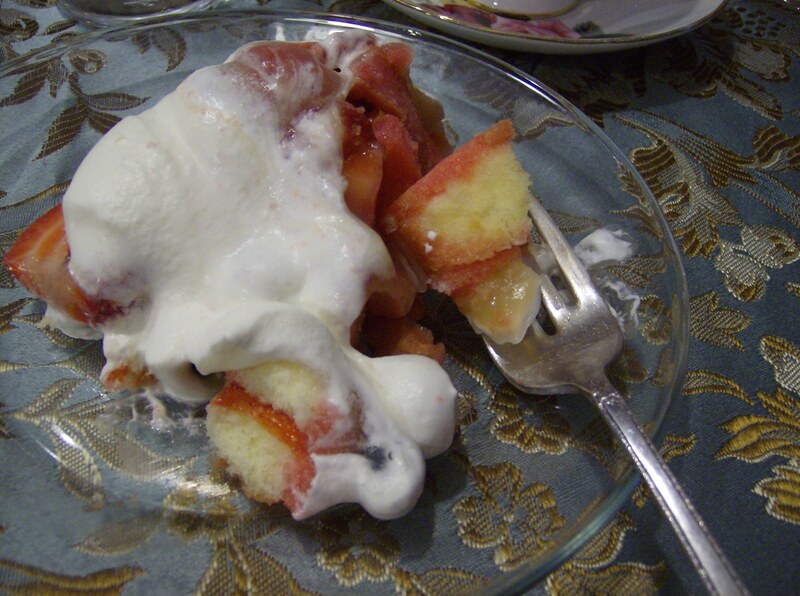 It is fairly straightforward to make, comprised of meringue and chopped strawberries mixed with whipped cream and sugar. Every person for whom I have made Eton Mess adores it, and it is a staple of my summer entertainment menu. I also love the apparent story behind its creation- it is said that Eton Mess came about when a dog sat on a picnic basket containing strawberries and cream, thus squashing them together and creating this magnificent concoction! 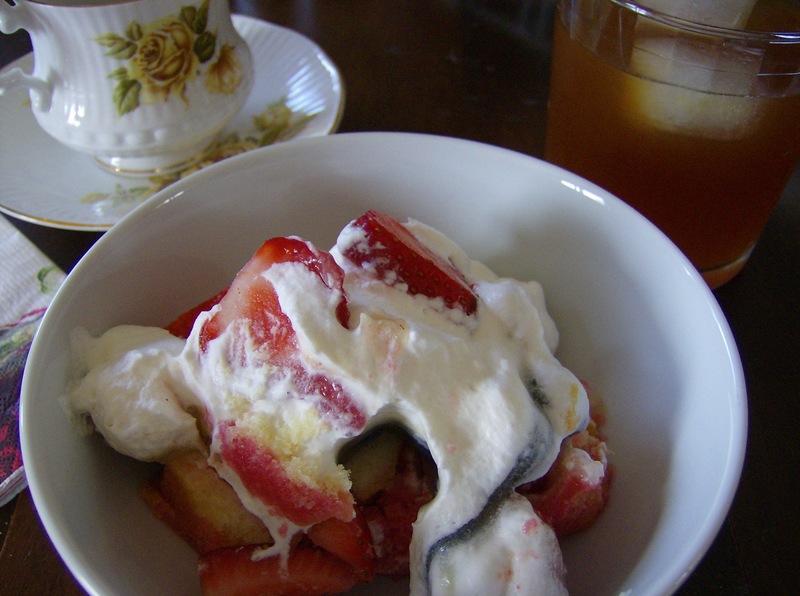 Photo of Eton Mess: from http://nicelyseasoned.files.wordpress.com/2011/08/photo-29-07-2011-21-21-155.jpeg. Attributed to Jennifer Lyons. Every British child must, at some point, have had a Jammie Dodger. These delightful biscuits first came to my attention through their mention in Doctor Who– as a result, I tried them and am now hooked. Jammie Dodgers are similar (in some ways) to the Canadian Peek Freans Fruit Crème, but they lack the creamy frosting and pronounced sugary taste of the latter. This makes for a much more pleasant biscuit in my opinion, because Jammie Dodgers do not make me feel guilty in the way that more sugary treats do! Jammie Dodgers are lovely with tea, and the toffee variety is also delicious. Thank goodness for the British food shop in my city- without it, I would have nowhere to buy Jammie Dodgers! 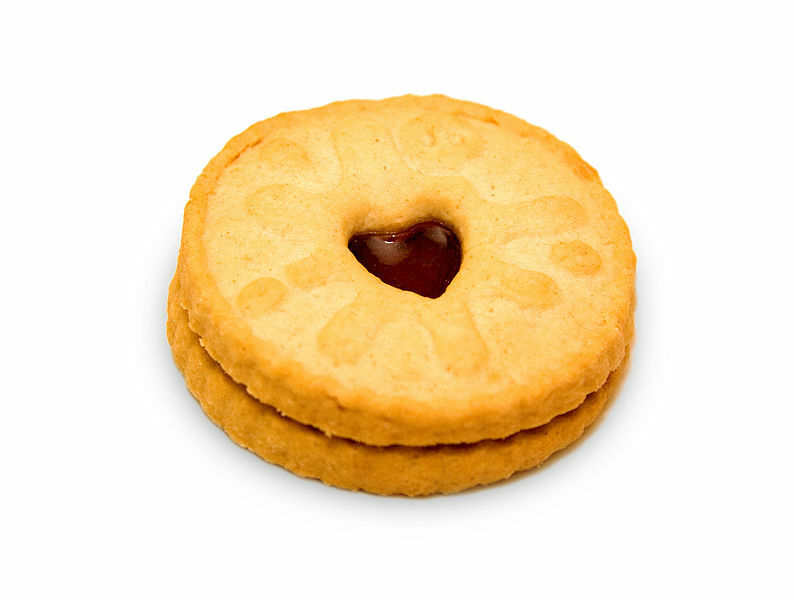 Photo of Jammie Dodger: from Wikimedia Commons. Attributed to Paul Hurst. I cannot imagine anything more comforting and warming than a good old cuppa. 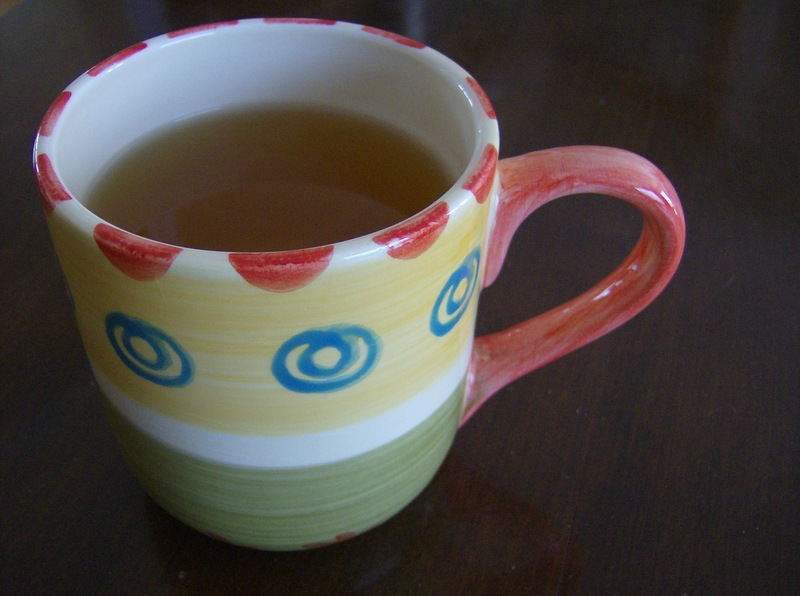 I probably drink 3-4 cups of tea every day, and tea always calms me and reminds me of England. 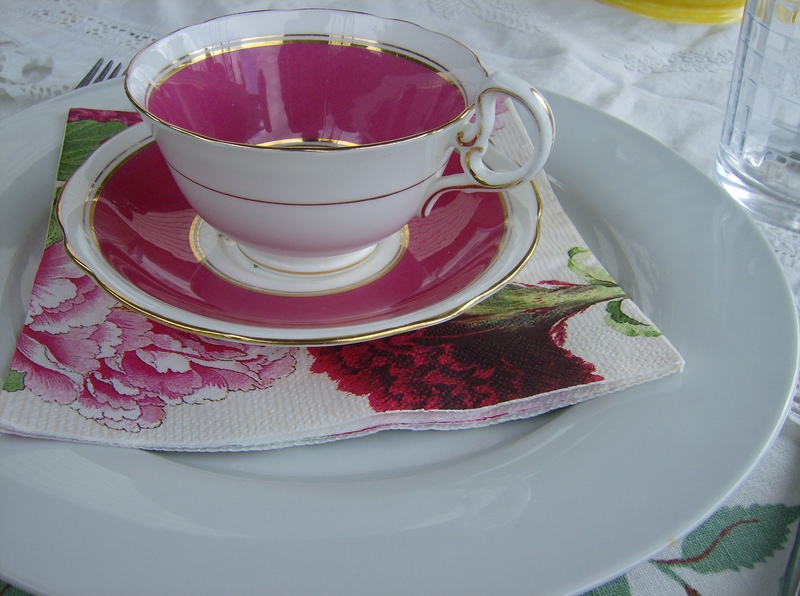 There are several kinds of tea which qualify as favourites of mine- I like original Yorkshire Tea, English Breakfast, Darjeeling, Earl Grey, and green tea. 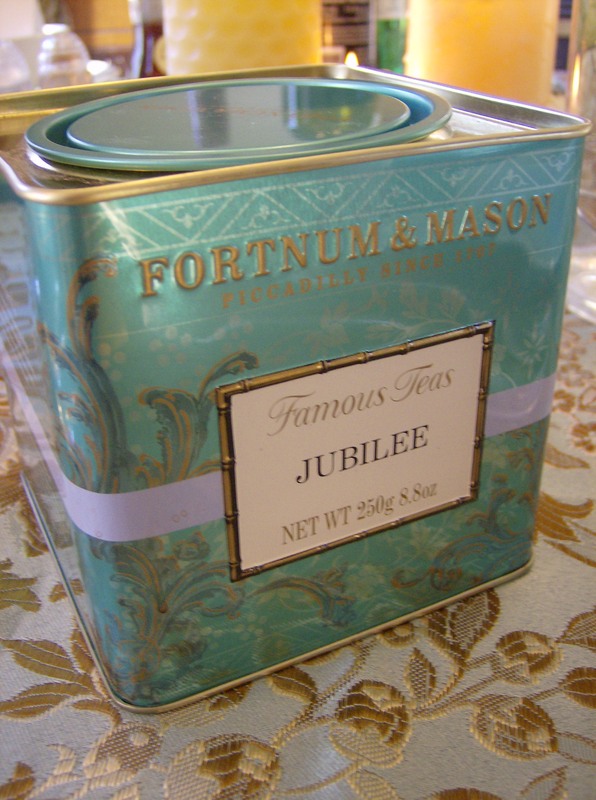 And last December while in London, I stopped off at Fortnum and Mason and treated myself to a tin of their tea. Fortnum and Mason is an unparalleled destination for tea, and I spent about forty minutes contentedly browsing their tea section! Finally I came away with their special Jubilee blend, which was made for Her Majesty’s Diamond Jubilee in 2012. Now that is a wonderful souvenir! 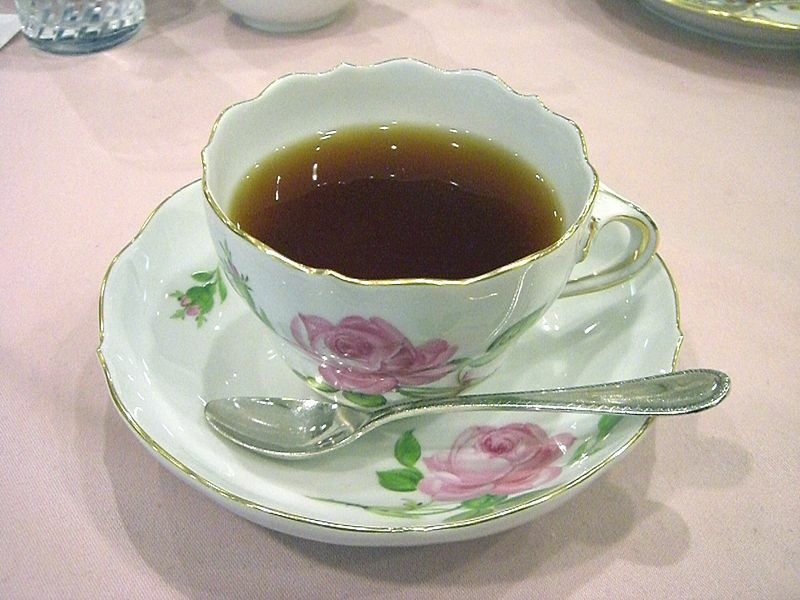 Photo of tea in teacup: from Wikimedia Commons. Attributed to Miya. As you can see, British food is beginning to shake its reputation of staid, bland heaviness. British food is actually quite tasty, and often incorporates several food groups into one dish. This cuisine, while still built on wholesome and hearty dishes, also has many options which are light, seasonal, and appealing even to people not from Britain. It is quite fortuitous for me that I am both British and such an enthusiastic fan of British cuisine! I hope that this post will inspire others to try a British dish that they have not had before- because if you haven’t eaten British food, you really don’t know what you’re missing!